A young woman inherits her grandmothers farm and, in need of a change, quits her high-powered job as a weather anchor to move out to the country. She gets more than she bargained for when her neighbor, Harlan Hunter, tries to persuade her to sell the farm. As if the pressure from Harlan werent enough, she is also battling nyctophobia  fear of darkness  and keeps seeing a mysterious stranger walking in the woods behind her house. With her faithful dog at her side, she decides to solve the mystery of why Hunter is so interested in the property, triumph over her fears, and discover who the mysterious man is. Sissy Morris, Harlans housekeeper; elderly woman; excellent cook; cheerful, goodhearted; asthmatic; visits her sister every Sunday; animal lover, keeps cats and dogs. Luke Gregorio, good-looking young man; hiding in Mirandas barn whilst trying to find out what happened to his identical twin brother, who worked for Harlan before disappearing; lies constantly to maintain his cover; shot twice but survives; admires Mirandas strength; rescues her from Harlan and his cronies. Harlan Hunter, Mirandas neighbour and former caretaker of the farm; tries to pressure Miranda into selling the farm; engaged in illegal trading. Bob Meeks, Harlans hired hand and partner in crime. A young woman moves out to the country where she has to stand her ground against a shady neighbour while fighting her paralyzing fear of the dark. It's not so easy when there are mysterious strangers roaming around your house at night. The battered mailbox at the side of the driveway had lost its door and the name painted on it was barely legible and missing several letters. This was the place, though. She recognized the long line of pine trees from her vacations here as a child. The massive trunks had looked like giants to the twelve-year-old she’d been on her last visit and still seemed so to the adult she was now. The dog in the passenger seat barked at the overgrown trees and bushes that flanked the pine-lined driveway ahead of them. “You might find a few things in there big enough to chase you,” Miranda added. She unlocked her door and rammed it hard with her shoulder to open it. The fifteen-year-old hinges released reluctantly and let in a mix of dirt, leaves and rain whipped by the wind. As she exited the car, Rufus slipped out past her, headed for a clump of weeds in a ditch that looked like they needed marking. Miranda held her jacket closed with both arms crossed in front of her and, head down, stepped toward the gate. The headlights offered a comforting circle of light around her. She tried hard not to look at or even think about the shadows that pressed close beyond the perimeter. The attorney had given her a set of keys, but it took several tries before she found the correct one for the rusted padlock guarding the farm’s entrance. She had to lean hard on the arm of the gate to get it to arc open against the force of the gale. By the time she secured it against the post at the side of the drive, the storm clouds had settled just above, ready to stay awhile. The raindrops had grown smaller but fell harder, cold on her face. Even Rufus seemed eager to avoid the elements, already waiting by the car when she returned and jumping in as soon as the door opened. He pressed his nose to the side window as Miranda slowly drove through the gate. The garage came into view first, worn doors rattling in the wind. The white paint was peeled and splintered, exposing damaged, dry wood. A light pole at the corner leaned as if yielding to the storm, the globe on top dark. Only Miranda’s headlights reflecting off the building cast shadows toward the bulky farmhouse on the right. Miranda pulled around the circular drive so she could see the place she planned to make her new home. The roof of the unscreened porch slanted drunkenly and the railing had long since rotted away. The steps leading to it were cement, at least, and looked secure enough. She put the car in park and turned off the engine but left the headlights lit. The place didn’t look like much from the outside, but it would hopefully be dry and warm inside. Anxiety welled up in her stomach. She looked into the rearview mirror, meeting her own blue eyes with a steely gaze. “You can do this,” she said aloud. She grabbed her overnight bag and a flashlight from the back seat and she and Rufus ran for the house. She shivered when she reached the comparative shelter under the porch roof, partly because of the cold wind and partly because of anticipation that was at least half fear. She’d forgotten how dark a country night could be when there were no stars or moon. There was only a smothering blanket of blackness that, if she looked too long at it, would feel suffocating to her. She fumbled with the keys again, finally finding the correct one. When she pushed the door open, she found her expectations of “dry and warm” had been a little high. As she stepped across the threshold into the kitchen, the room was dry, at least, despite the dripping she heard somewhere at the back of it. But the chill that pushed back at her felt like all the winters since her last visit had been stored inside, awaiting her return. There was a switch on the interior wall, but when she flipped it no lights turned on. Looking up, she saw an empty socket outside and decided that that switch must be to control the porch light. There had to be another one for the interior lights. She couldn’t find it anywhere near the entrance, however, and a quick scan with her flashlight showed only towers of boxes covering a Formica table and stacked nearly ceiling-high along the floor. Rufus sniffed at the corner of the nearest cardboard pile, whimpering and scratching. He gave up his quest, but when Miranda moved forward, giving him instructions to heel, he clearly had difficulty accepting the restraints. There were appliances on the other side of the wall of cardboard: a stove with rusted cast-iron burners, a refrigerator with a rounded top that was shorter than Miranda, a long porcelain sink attached to the wall. There was also a light switch, one so old it had two buttons rather than a flipper. Her relief was premature. Nothing happened when she pressed the top button. She tried several times, as if repetition were the key to success, but despite that and the panic rising in her throat, the bare bulb hanging from the ceiling remained dark. Removing it, she shook it to make sure it wasn’t burnt out, and then she returned to the porch. The light that still flooded the entrance from her headlights felt like such a relief she sighed and felt the tension in her shoulders ease. The rain had increased, flooding the gutter that hung from the roofline on only one bracket. Having put the bulb in the empty socket, she tried that switch again. Nothing. 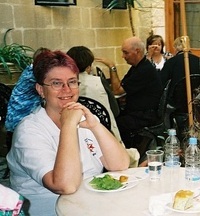 Deb Donahue is a freelance writer and editor with several short story publications in her portfolio. She is also the author of a series of suspense novels published by New Libri Press under the name Debra R. Borys. She lived most of her life in small town Illinois and for several married years canned home-grown vegetables, rendered lard and butchered her own meat. She remembers those days with mixed emotions as she shops in Seattle WA these days for processed, ready to eat meals.